I thought I would start a planning blog after reading so many on here and being inspired by so many ideas. Me and H2B have been friends for the last few years and only became 'official' 5 months ago after a lot of talking and getting to know more about each other. He knew all about my previous abusive marriage and the crap relationship that followed after that and he was totally ok with the fact that technically I am still married (divorce process has been started) and have an 11 and 7 year old. He unofficially proposed to me back in November but I told him to come back when he had a ring lol. We was visiting some venues on Saturday to get an idea of was on offer, even though I had decided what venue I wanted already. My best friend who is also my MOH had arranged all the visits and came with us along with my daughter. She deliberately made sure we visited my dream venue last. Little did I know that they was in on the secret proposal that was about to happen. 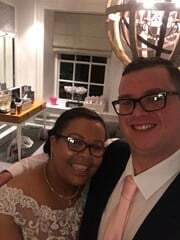 We had just finished viewing our dream venue, which was covered in snow and looked amazing and my youngest kept going on about going upstairs with her as there was something she had to show me and kept mentioning that Andrew (my H2B) had a surprise for me. Me and my daughter started to go up the stairs and all of a sudden I heard Andrew tell me to stop and turn around and there he was on one knee. I almost fell down the stairs at this point as my foot slipped lol. He asked me to marry him and then gave me the most amazing ring! Me, Andrew and my daughter started crying and hugging and my best friend had caught it all on camera and was crying too. It may not be romantic to some people but to me it was amazing. My MOH thought it would be a good idea to go and try on some wedding dresses to get a sense of what I liked and didn't like and see what shilouette suited me since I've lost 10 stone over the last 6 years. She took me to the shop she got her dress from Elizabeth James Bridal in Croydon. The owner Jacquie asked me what was essential, I told her not a straight neckline and absolutely had to have sleeves as I hated my arms. She gave me some blue tokens and told me to put them on the dresses I liked while she chose some she thought would suit me. We had about 10 dresses to try on. The first dress I tried on happened to be 'the one' but made myself try on the rest before going back to dress number 1. My dress is Lorie by Maggie Sottero which I'm having as a corset back and wearing with a reverse jacket to give the illusion of sleeves with a different belt to the one that comes with the dress. I'm also wearing a cathedral length veil. There was tears all round and my youngest daughter who is 8 turned and said to me 'Mummy, are you saying yes to the dress?' To which I replied Yes. The deposit was paid and my dress is now on order. I've ordered a size 16 which is my high street size and one size smaller than the one I tried on in the shop. I'm booked in to be measured again at the end of September as I am planning on losing 2.5 stone before my dress comes in at the end of the year. She did ask if I wanted it in for September but I said no. Hopefully going back there next weekend to try on the sample and jacket again to take some pictures. Well done on your weight loss that's an amazing achievement, hard though isn't it? I've lost 4 1/2 Stone in the last 14 months but it's lovely being able to go into shops and choose high street clothes and have them fit! It's been a long slog. Definitely finding it harder to lose it now, think my metabolism has slowed. 1-2lb a week will get me to my target. My GP told me she wants me at 8 stone 9, that's not going to happen as I'd look ill especially as I'm 5ft 8 and well built all over. Hi louise your ring is stunning emerald cut halo diamond ! I hear you re at the start of divorce, i have just had my decree absolute through in feb it took two years to complete and has cost around £3000, its been worth it though as i was married for 28 yrs before and have found a man that ha shown me what real love is. I wont say it was a waste because i have my daughters. I wanted to wish you all the very best with your future happiness and your divorce Proceedings. I agree at that height and that low a weight it just wouldnt look nice, I'm 5'3 im aiming to get to 9 st 12 won't happen before the wedding but im already a size 14 my friend who got married last year and is the same height as me was a size 8 on her wedding day and weighed 9st 6 so I think your doctor is being a bit irresponsible setting such a low goal weight! I think you just get to a place where you feel good and as long as your in a healthy weight range it's all fine isn't it? Anyway enough about diets, who designed your dress? Hi Katherine - I love the ring, the guy did good. I have to admit I absolutely hated it when my H2B suggested a ring like this as I was after a princess cut lol. Today I ordered the flowergirl dresses for my youngest daughter, my niece and Andrews niece. Found them in Monsoon and the pictures don't do them justice. They're pink and sparkly and I got all 3 with matching head accessories for £146 with 10% off so a bargain. The girls will be nearly 3 and my daughter will be 9 so I've ordered age 10 for her and age 3 for the others. Shoes were doing next year once we know what size they will be in the summer. Bridesmaid dresses and cover ups came from Debenhams for my eldest daughter and 2 of my best friends. I've chose the light pink 'Sophia' dress and again had a 20% discount on them. Again shoes will be chose next summer. In their hair they will be wearing pink marabou feather clips. Ah you're getting married 2 days after me! Well done on your weight loss that's amazing, had a quick google of your dress and it looks beautiful! Love your bridesmaid dresses, my daughter who will be 10 this week is wearing an Estella dress too but in ivory, I had to get a petticoat for it though as we realised it was completely see through! got a bargain on her shoes in the Debenhams sale £6.70 reduced from £24. I really liked the same adult dresses but in blue from Debenhams but when we went shopping they didn't have them in so we ended up have dresses from Coast instead. I wasn't keen on the ivory one, thankfully the dresses go with the ivory faux fur shrugs I got in the sale for £16 (Was £48). Bargain on the shoes. I can't do that until next year as I don't know what sizes they will all be. I've promised my H2B and MOH not to get anything else now as we have booked all our suppliers etc now and going to focus on paying for things each month until it's all paid off. Whitch will be May next year I'm still trying to convince Hun regarding fireworks and increasing the florist budget by a further £500 even though I went over budget by £600 already. Oopps! That is an oops! I'm off to see my florist for final consultation in 3 weeks, originally thought I had it all sorted but have decided to make some changes but hoping to just swap things around and I won't affect the budget too much. I've heard rumours that my uncle might organise fireworks for us, but I don't think I'm supposed to know! I had pretty much decided on the venue before getting engaged and before even seeing it in person. We visited 2 venues, Farnham Castle and Barnett Hill Hotel. - You had to hire the whole venue at £17000 which didn't include food, entertainment etc. Our budget for a venue was no more than £9000 all in. - Drinks reception mid canapés were extra. Barnett Hill offered an all inclusive package which is for upto 120 people. The cost was £8500 and included an evening hot/cold buffet. Could have fireworks and confetti and we could book as many of the 56 rooms as we wanted and could decorate it how ever we liked with flowers etc and there was no restriction. Plus they are giving us 2 pop up bars as well as the main bar so the guests won't go thirsty. There is an amazing 26 acres of land and also an outside chess game set and beautiful lakes and scenery. - We can only have the ceremony room and function room as part of our package. If we wanted the lounge and the other ceremony room (to give me a longer aisle to walk) then we'd have to go exclusive which was another £8500 on top of our package and to be honest, it was what I wanted in the beginning but it's just not worth the extra money for the sake of 2 other rooms. - Its currently being refurbished and not due to be completed until the month before our wedding! Andrew loved the venue as much as me and we got all teary and emotional as we could see ourself married there. Once we'd confirmed with the registrar our date and time we went ahead and booked our venue. The next big thing for me was flowers. My first wedding was made of purely fake flowers, the only relay thing was my bouquet. It was the one thing I regret scrimping on. This time I've decided that I wanted them to play a big part in my wedding. Andrew told me whatever made me happy we could have in terms of flowers, his only request was that we could incorporate some calla lilies. So, our first budget was upto £1000 for everything. I'd arranged some consultations and went armed with my 'wish list' to see what could be done. First off was Jane Packer, admittedly I only went there because they had done lots of celeb weddings and I wanted to see what I could get for my money, which was hardly nothing. For a bouquet it was coming to £300. 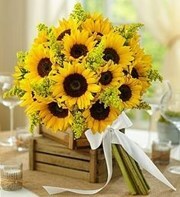 My budget would only get me bouquets for me, my bridesmaids, button holes and corsages, That was it! If we had tablecentres, long and lows plus decorations for the staircase etc it would have been nearly £5000! A plus point was she googled the venue and sourced pictures of the hotel, rooms to be used etc. Next, was Elise from Floescence. A bit batty, but didn't get what I wanted to achieve. She was a recommended supplier by the venue. I was willing to hear her ideas but all it was was 2.5 hours of her doing the hard sell and what did it for me was when she called couples with a limited budget 'little people', wanted to know the dress sizes of my bridal party and called my MOH miss piggy, which didn't go down to well. Needless to say, we never chose her! By this point I'd started to think I wouldn't be able to afford what I wanted until I met the amazing Gayle from The Wedding Flower Company at the National Wedding Show. We'd decided to increase the budget to £1500. She instantly got what I wanted to achieve despite my limited budget and gave me a quote which was bang on budget. We paid the deposit and she arranged a site visit to check out the venue. By this point I'd realised that I hadn't factored In the staircase and window ledges in my original vision. Flowers are mainly roses and calla lilies to complement our colour scheme with eucalyptus and other foliage. The flowers, lanterns and pedestals that were on the stairs were going to be moved into the reception room during our ceremony to use as decorations leaving just the organza draping, fairy lights and posies. This wasn't what I wanted as I wanted to have pictures on the stair case even more so because it's where Andrew proposed to me. So after talking to Andrew and being really upset as I didn't want the flowers to be taken from the stairs, he said 'just increase the budget because we've manage to save on other aspects of the wedding'. So for an extra £450 were having 2 extra pedestals, lanterns and posies and 2 large vase arrangements, plus small bases for the pew ends to sit in on the window ledges and a few other bits and bobs. Needless to say I am now happy. Our total flower bill £2300. Initally we had decided to wait until closer to the wedding to order my ring but after the wedding show we went and had a look at some rings. Because I have diamonds on the shank of my ring I needed a ring that wouldn't rub against it. I fell in love with a wishbone ring which complemented my ring perfectly and it was 20% off so needless to say I paid the deposit and collected it today. Also ordered Andrew's wedding gift and collect that next week. Now to store my ring somewhere safe until the big day. Andrew is currently deciding what ring he wants but doesn't want it until next year. 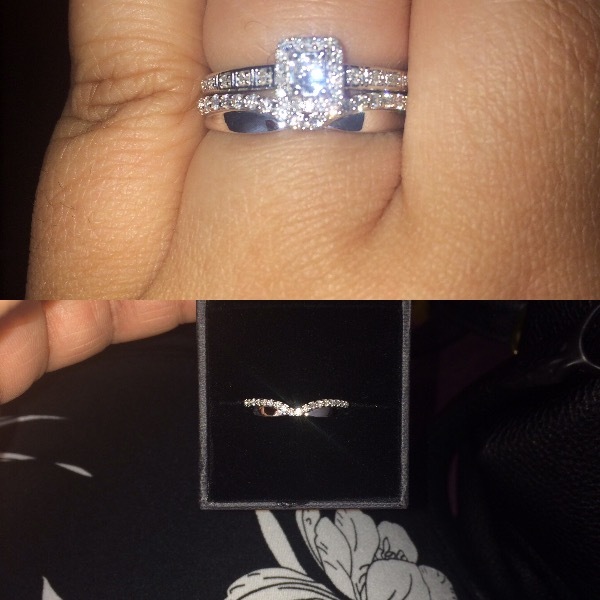 Below is a picture of my E Ring and wedding ring. Your wedding is just as interesting as everyone else's and as for expense it doesn't matter, big budgets, small budgets or indeed huuuuuge budgets they all have something to offer, your day will be just as special as everyone else's but f you're not enjoying writing a blog then that is your decision but I for one had enjoyed what you'd done so far! Thought I would upload some pictures of a few things I have purchased and the beautiful jewellery set gifted to me by my MOH. The only thing I've not purchased is the flower girl shoes as I can't really do that until next summer. They also do a glitter pair which would also go with the dresses but I may just stick with the pastel pink. My diet isn't happening at the moment. I start good but then by the end of the day I've undone it all. I am feeling the pressure as I am being remeasured in September at the bridal shop and wanted to lose 2 stone by then. My dress is due in December and I've ordered a size smaller but my current measurements are spot on to the size I've ordered plus our engagement shoot is in July and I wanted to be on my way to my target.........I think I need to stop stressing out! Bridesmaids accessories, only £9.60 from Debenhams down from £30 Converse shoes for the flower girls £29.99 from Office Ivory & co jewellery set (gifted by my MOH) and was £81.50 (half price) Alan Hannah tiara from Debenhams in the sale for £62 Jon Richards hair comb from Debenhams in the sale £24 Ivory & co 'Toulouse' cathedral veil which was half price at £71.50 from the National Wedding Show. It is dotted with Swarovski crystals and is absolutely beautiful. It's currently in my wardrobe in a veil hanging bag with matching hanger which I got from Britten for £20. Oh good youre back to write! Pretty jewellery. Love your tiara and what a fantastic deal on that and your veil. My veil is also a two tier cathedral length with swarovski diamanté scatter, I thought that was a bargain at £100 but yours was even better, mine is still in its box as I have my hair trial next month and it will be easier to transport like that, but I've got the bag and hanger all ready for it after that! Oh just saw your veil hanging set, that is brilliant, mine was just a veil hook and a plastic bag, so I've just ordered one like yours so much better for storing my veil and I'd be able to transport it to the hairdressers in that. Thanks for the tip off!! Here are some of the designs we have decided on for our wedding. Only thing to decide on is table centres but I've put up a picture of what I like. I am feeling inspired. Our colour theme is pastel pinks, lilacs and blush with a bit of sparkle. Pedestals. Either side of top table and outside ceremony room. Possibly 4. Buttonholes. H2B is thinking of Calla Lillie for his. For the window ledges on the stairs and reception room. Possible tablecentres. Possible bouquet trim for my bouquet.